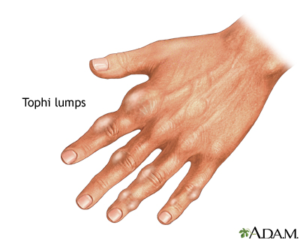 Gout is a form of inflammatory arthritis that develops in those who have high levels of uric acid in the blood. 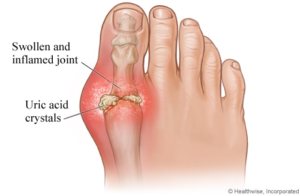 Uric acid is a chemical substance that can build up in the blood to a higher than normal level and lead to gout. The acid forms needle-like crystals in joint spaces, most commonly in the big toe. Uric acid is a substance that results from the breakdown of purines. Normally, uric acid is dissolved in the blood and passed through the kidneys into urine where it is eliminated. However if there is an increase in the production of uric acid or if the kidneys do not eliminate enough uric acid, the levels build up in the blood, a condition called Hyperuricemia. Those who consume high purine foods such as organ meats and shellfish can develop hyperuricemia and if untreated can lead to Gout. If you have any concerns, questions or are suffering from gout, please book into Podiatry HQ at your earliest convenience so that one of our skilled podiatrists can address any issues you have and form a treatment plan.